Last July, we trained some members of Canaan AG to heal the infirm using the authority given by the Lord. 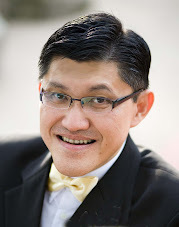 This time, Pastor Daniel Leong, the Senior Pastor, has invited us back to minister on Resurrection Sunday. 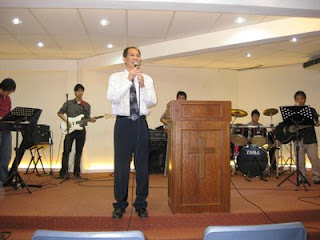 When we arrived, the worship leader, Brother Rowlance, had the congregation singing with great enthusiasm. The highlight of the day was a skit. It was unique because the skit was videoed ahead of time. The actors, who were the young people of the church, brought the house down with laughter. My wife, Grace presented a special number and she sang a solo piece. 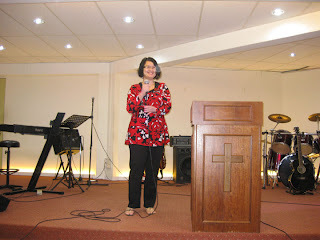 With her song, ‘Knowing you, Jesus’, I launched my sermon. 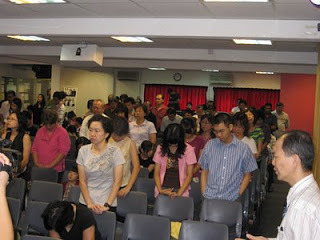 Praise God that the congregation responded to the call for each to become fearless in winning family members to Christ. During the time for healing, 9 people came forth to be healed. 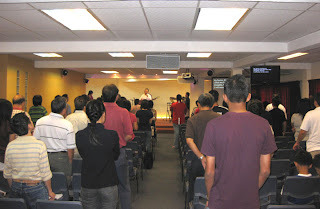 Prior to that, I had already invited those Elijah Challengers to stand at the altar area, facing the congregation. They had also arranged chairs in the front. As the infirm filled those chairs, the trained believers interviewed them. Subsequently, they laid hands on the infirm and repeated what the commands that I shouted. Among the infirm was a middle-aged gentleman who was not a believer. He suffered from shoulder and knee pain. I instructed the Elijah Challengers to lay hands on his knees and healed them first. However, God was very gracious - the man’s shoulder was also healed. A lady who had headache did not receive healing at the first command. However, during the second command, she felt a hot sensation on her head and then the headache was gone. There were two brothers who had neck pain. Another with pain on his shoulder and after we took authority, the pain moved to the upper arm. We continued to rebuke this pain and spirit of infirmity until the pain subsided. A young child was having coughs and came forth to be healed. Another young child who used to suffer from nose bleed believed God for healing. A sister had ‘weary’ eyes and sought the Lord to strengthen her eye. A brother heard voices in his head and trusted God for healing. We praise God that every infirmed person felt relief and marked improvement of their condition. They felt that the ‘mountain’ did move and they thanked God for their healing. Praise God for a wonderful Easter Sunday. Twenty-two participants attended the First Training Session of The Elijah Challenge. Apart from the Singaporean participants, there were some who came from Vietnam, Philippines and Malaysia. The session was very lively with much response from the participants. 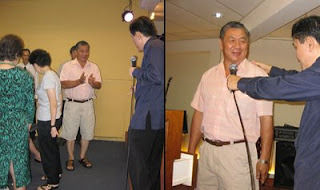 During the healing demonstration, all three who came out for healing were miraculously healed. Pastor Alicia was healed of her arthritic fingers and testified with great joy. 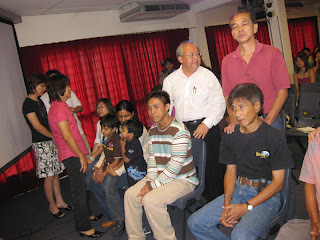 A brother testified how God had healed him of his pain in his stroke-afflicted body and gave him strength in his legs. It was a wonderful evening of witnessing the glory of God. On the second and third evening, the Elijah Challenge training continued with this faithful group of dedicated believers. A few more people had joined the rank. Their hunger to learn how to exercise their God-given authority to heal the infirm and share the Gospel was most inspiring. Some had been taught other ways of healing but after three nights of training, these believers said that they preferred to follow the biblical way of healing. They wanted to heal the way Jesus and the early Disciples healed. They also liked the verse-by-verse approach. That, they said, left them no doubt that it was the way the Lord wanted His servants to evangelize. More miracles happened. 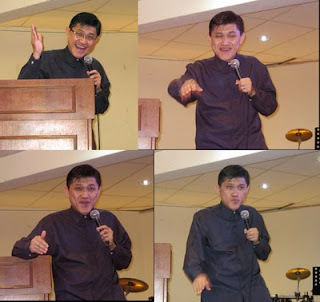 One brother, with a painful elbow, was healed and the pain left him. However, the pain came back the following day. He came back again for healing and the pain left him completely. Apparently, infirmity seeks to return whenever possible and one has to continue to resist its return by rebuking in faith. Another brother was ministering healing to others but he himself was miraculously healed of his leg pain. He squatted a few times to prove that he was healed. 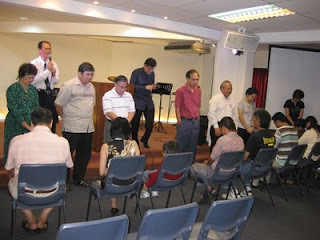 A brother had an ankle problem and after the trained believers laid hands on him, the pain left immediately. On the third evening, a sister who had a painful right shoulder was healed but the pain returned. She was discouraged but came forth for a second time of healing. Praise God that she was completely healed. An Indonesian sister was healed of neck pain when the trained sisters of the church laid hands on her. Two Vietnamese brothers sacrificed their income and took a taxi to come with their landlady. This elderly lady had pain all over her body but as expected, the Lord healed her and took all her pain away. 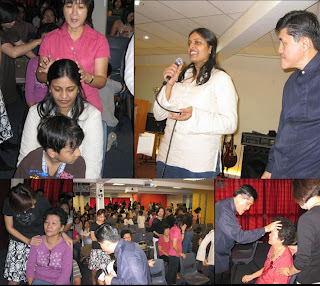 On the evening of Saturday 28 March 2009, the City of Truth Church conducted its First Elijah Challenge Healing Service conducted at its premises. For the first time, the trained believers had to exercise their God-given authority to heal non-believers in the name of Jesus. They were amazed and thrilled that miracles actually happened when they laid hands on the infirm. A young man from Myanmar, whose back and legs were hit by falling concrete, suffered pain for over ten days. 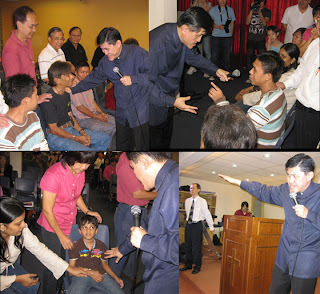 When the trained believers laid hands and commanded the pain to go, this young man was healed instantly. He testified that all the pain was gone as the congregation gave God a clap offering. The body of a middle-aged man had suffered from a strange disease – the whole body was like being gripped by a clamp and it tensed up. He said that for more than thirty years, he was in that tight condition. That evening, the Lord set him free. 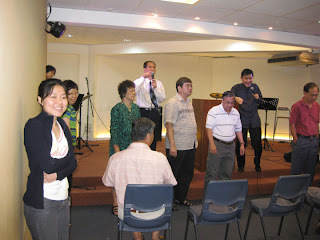 An Indonesian young man had a chest problem and was duly healed. A Hindu lady was brought by her son for healing. She had pain in her body and also her knees. 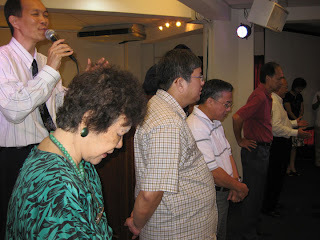 According to the son, she was reluctant to come but after some encouragement, she attended the Healing Service. The Lord was so gracious to this lady and healed her from the top of her head to the bottom of her feet. She was set free and kept saying, “Thank you, Jesus! Thank you, Jesus!” We were almost in tears when we witnessed a grateful heart giving thanks to our Lord and Savior. On Sunday morning, as a continuity of what God had been doing during the week, the Sunday Service was specially designated as a healing service. Once again, the faith of the trained believers moved the hands of God. 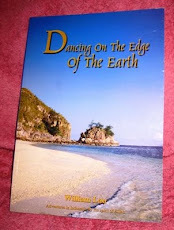 A number of people were healed and delivered from chronic pain. Praise the Lord. 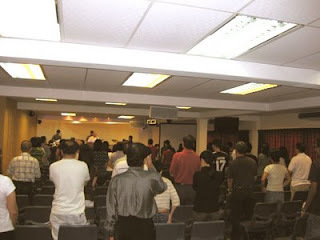 In the evening, the City of Truth Church conducted another healing service. This final night was another time of miracles. The trained believers were bolder in commanding the diseases to go in the name of Jesus. A brother received relief from his toothache but was told to see a dentist as soon as he could. A man, who had imbalance in his head and some problems with his ears, received healing from the Lord. After a few times of commanding the infirmities to go, he proclaimed that his hearing had greatly improved and he felt much better. 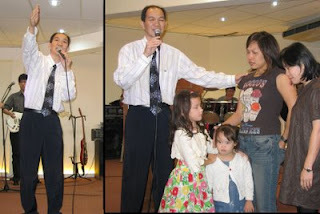 A young lady was immediately healed of her painful foot after two sisters faithfully took authority over the infirmity. A 60-year-old man who was an official from a Buddhist temple, attended the healing service upon the invitation of his good friend, This Buddhist had pain on his left arm. The Lord promptly healed him when the trained believers commanded the pain to go. Right at the altar, Pastor Alicia and others led him to Christ. He confessed his sins and surrendered his life to Jesus Christ. We thank God for giving us all these miracles. Our faith still needs to grow into an authentic movement-moving faith. May God grant us this request so that we can be powerful witnesses for Christ.